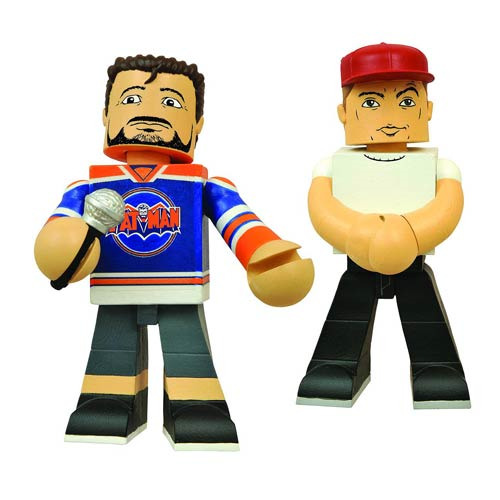 Jason Mewes and Kevin Smith have visited your home through the magic of podcasts, but now they can live in your home forever, as vinyl figures! Better known as Jay and Silent Bob, Jason Mewes and Kevin Smith are best buds, whether they're on stage, on-screen or in a recording studio, and now these 5-inch tall vinyl figures of the pair are packaged together, joined forever in plastic matrimony (at least until you open the box). Sculpted in the Minimates block-figure style, these 2 static figures come packaged in a full-color window box. Ages 14 and up.